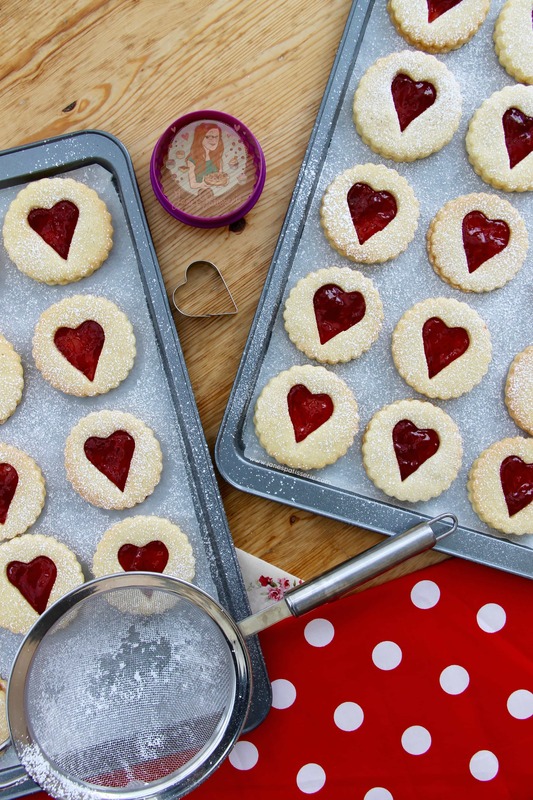 Homemade Jammie Dodger Biscuits based on the classic biscuit. Soft, sweet & crunchy biscuit filled with your favourite flavour Jams! 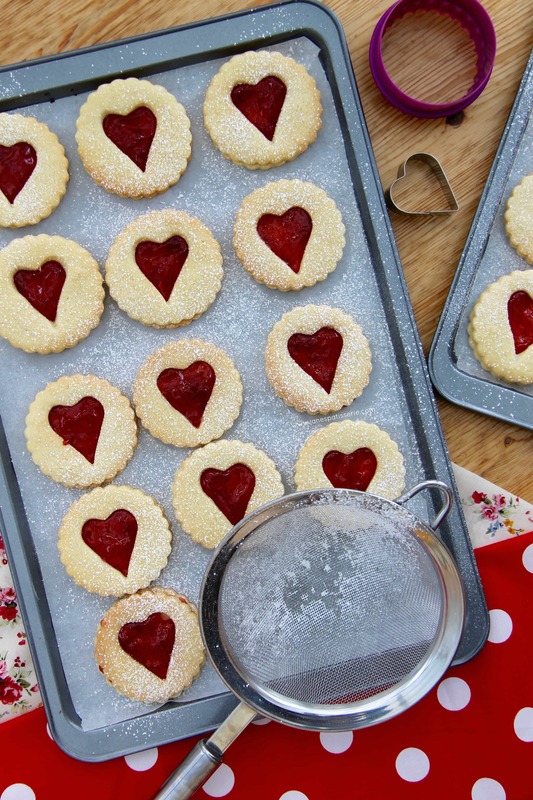 I have always loved baking cookies, and biscuits and all things jammy – but sometimes I just can’t be bothered. However, when it comes to Jammie Dodgers? I used to be addicted to the shop bought ones all the time – and they featured on my Jammie Dodger Cupcakes for ease (as they were requested to be that way) but I usually bake my own. 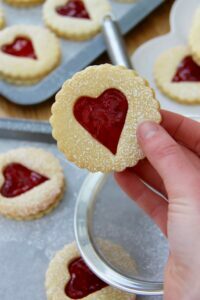 Seriously, home-made Jammie Dodger biscuits (sometimes referred to as Linzer cookies) are delicious – I use a slightly more in-depth biscuit than just a shortbread (but you can do that if you prefer) but I love this. The egg makes the dough richer, the Foodie Flavour flavouring makes it sweeter and gives it a delicious fruity flavour along with the Jam – but the flavouring married together is perfection in my eyes. As it is nearly Valentines day I decided to post these as Heart & Circle Jammie Dodgers, like the classic ones, but as you can see.. my cutters are a little bent. I have used the same cutters than were handed down to me from my Gran (seriously, it feels like there are hundreds) and I will still always use them now. I don’t want uniform shapes in my biscuits, but obviously – you can! 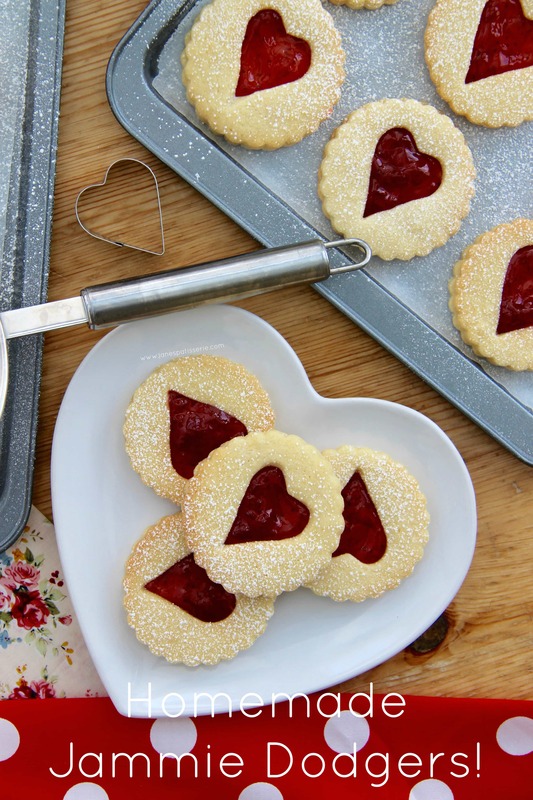 I make these as flowers, hearts, circles, even triangles sometimes and they are still equally as delicious and yummy every time! My personal favourite is to fill the biscuit with Strawberry Jam as its my favourite, but sometimes I do an assortment of many – they suit going on cupcakes, being dunked in tea or coffee.. or just being gobbled up at work! Heaven! This recipe makes 25 Biscuits! 1) With a whisk (electric is best unless you’re a machine) beat together the butter and icing sugar until its smooth and combined. Once combined, add in the Foodie Flavour Fruits of the Forest Flavour, plain flour and egg yolks and whisk again until there is a dough! Wrap up the dough and refrigerate for at least one hour. 2) Once the dough is chilled, preheat the oven to 180C/160C Fan and line two-four large baking trays with parchment paper. 3) With half of the dough, roll out the dough to roughly the thickness of 1-2 £1 coins and cut out 15 circles/hearts/shapes (Preferably a 6-8cm cutter) and then using a smaller little cutter (As you can see in the photos) cut out another little shape in the middle so that you’ll see the jam once they’re assembled. Split them between the two trays and bake in the oven for 10 minutes! 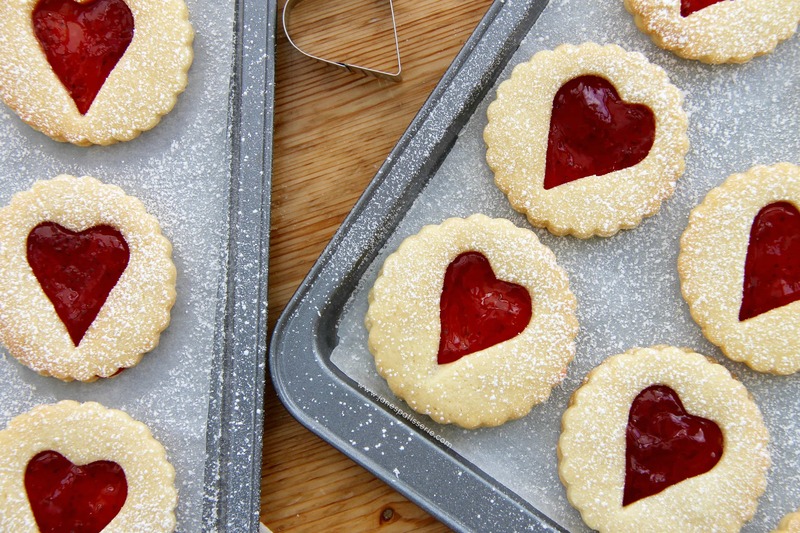 6) Dust the biscuits with some icing sugar and enjoy! You can buy Foodie Flavours HERE – I used Fruits of the Forest to match the fruity flavouring of the Jam, but they have oodles of different flavours which would be ideal. They are VERY strong flavoured, so you don’t need much at all – but they’re super super yummy! You can use whatever flavour Jam you like, Strawberry is my personal favourite though and is what you can see pictured. I made my centres into little hearts for Valentines, but you can make flower shapes, circles, squares, whatever you fancy! These will last in an airtight container for up to one week but would also be a great topped for my Jammie Dodger Cupcakes! Older Next post: No-Bake Caramac Cheesecake! Newer Previous post: Valentines Chocolate Bark! How do i get the jam to set so flat and shiny and smooth? Have you heated it all? Thank you! Can I use something else instead of the Foodie Flavouring? If I filled them with lemon curd, could I use lemon extract for example? Hehe thank you so much! And yes you should! 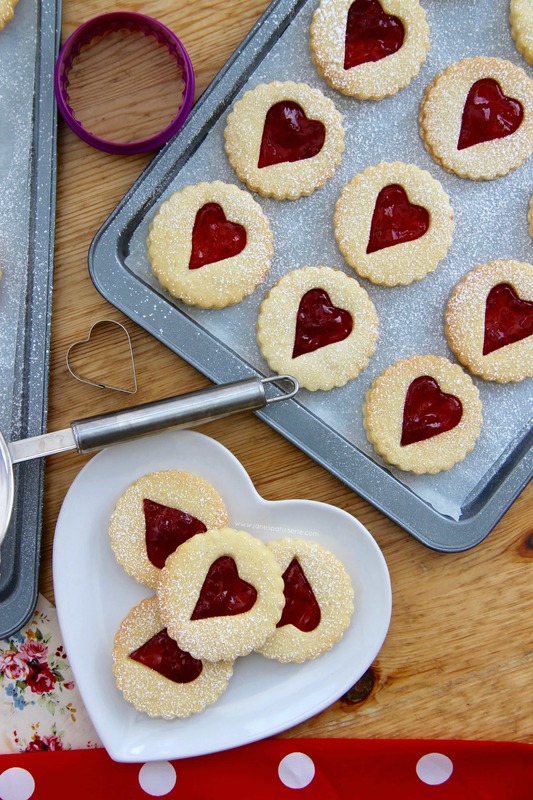 This look so delicious Jane, and you’re right – perfect for valentines day! I have all these ingredients at home already! Totally could make them now!